Bake it big and make it big! 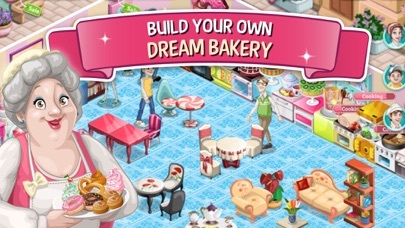 Do you have what it takes to save your bakery? 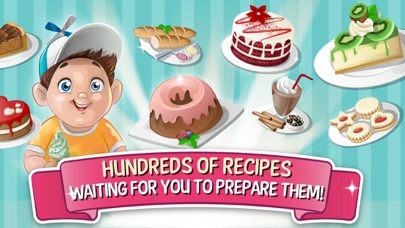 Bake gorgeous cakes, delicious cookies, mouth-watering muffins, scrumptious pies and plenty more! Make different types of coffee and tea or smoothies and yummy milkshakes! The better your tasty treats, the happier your customers will be! 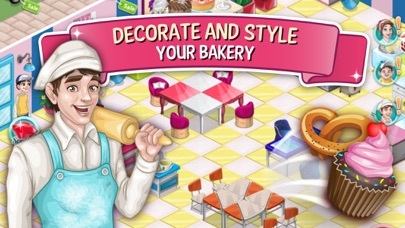 Watch your bustling baking business rise like your pies - expand your menu, invest in new appliances, display your edible masterpieces and decorate the place with hundreds of cool, fancy and fun items. 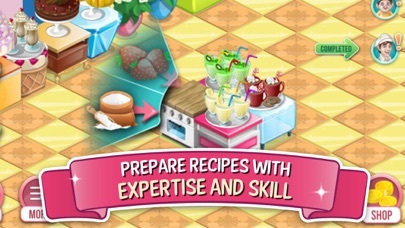 Buy wallpapers, windows and doors, tables and chairs, employ better chefs with special skills, add more space to your bakery and even more floors once the business really gets boomin! Connect with your friends via Facebook or Game Center, share your accomplishments, send them gifts or write on their walls. Update: ~I just deleted this game. Too hard to get gems and I just accidentally finished cooking the rainbow smoothie instantly which cost me about 17 gems. It makes me furious, I worked so hard for these stupid gems and I keep accidentally using them for stupid things like this!~ It’s retro and fun, reminds me of various FarmVille type games on FB, but I’m at a point where I can not advance without diamonds and it’s too hard to earn diamonds regularly. Also, I’ve collected a bunch of diamonds and keep accidentally using them for ‘instant cook’. I’ve lost over 20 from about 50 so far just by hitting the button, it would help if a warning would pop up that I’m about to use them. Also, there is a lot of scrolling in the friends section. Every time you send a gift the screen moves back to the top and you have to scroll all the way down to send another. It’s hard to find out which of your friends are actually putting in the work too. An update is much, much needed. Hello, Developers I do like Bakery Town. But when pop up commercials come. I can’t exit the commercials after they have done playing on my iPhone . It basically stops me from resuming the game. So then I have to delete the game. Redownload the app. So please stop the pop up commercials. Because I can’t play the bakery town at all. I have to wait for intro to the game reset itself. So that I can get back into the game. Also even though I have the sound on in the game. The sound also on on my IPhone. The game still goes silent. I have to turn off my IPhone. Put it back on for the sound to come back to normal. This is frequently. Are you really taking to heart that the Pop-Up videos. Are an obstruction to the game. So please stop the from constantly popping up. Because before it never happened. All that I need is play watch videos on my own to get gems . Like the watch videos on Bakery Town . Chef Town. That is what should only be on all your game apps. So why is that I’m still seeing pop-up commercials? For game apps? General commercials? Still. I thought that by now someone on from your Developers group. That would have solved the pop-up video commercials. By stopping them . Would be reading the reviews on this app. By now Halt the pop-up app commercials. Everyday I keep on have obstructioning app commercials pop-up on the screen. Half of the time they’re capable on exiting the screen. But other times the app pop-up commercials freezes on the screen. 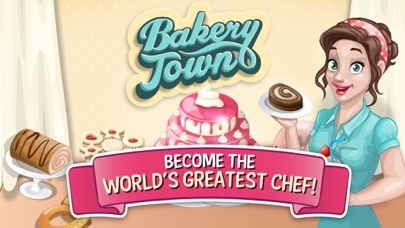 I have been frequently having to “ redownload” the app Bakery Town. Everyday. The cakes and drinks don’t go expire if you don’t collect it in time, that’s just awesome. I can come back anytime. I felt like people like the game too, no ID needed to add one another, most of neighbors are active and pretty helpful, I felt connected. I've enjoyed the game a good long while but there is one serious flaw. If a player was to accumulate 999,999 coins, that player should be able to transfer those coins into 111 gems. That is it; that is all. A simple programming task to reward the "good" program customer who brings other customers along. It would stimulate the person to remain to do it again and again thereby increasing company revenues, but no, the company is very short sighted. Too bad. Alors, au revoir.... UPDTATE: My experience with the Customer Support team has been 5 star, start to finish. The problem arises only to be solved by the CS team. The latest required removing the game from the iPad then reinstalling it from the iCloud after several months. Only problem is I have to make a purchase for the game advertisements to go away, which I can't do because of credit card fraud to the card. Anyway, I'm going up to 4 stars from 3 because of CS. Nota Bene! There is no way to recover earlier incremental saves without it costing. I have circa 40 million coins and level 70 and a load of items, etc. but have experienced program bugs, errors and now degradation. The graphical system is corrupt and unplayable. I lost it all. It happened to a relative as well and the company was useless. A very sad ending to what began as a fun game.